The Blue Line begins in the Carolina's. It appears the Blue families in North and South Carolina emigrated from Scotland (probably from Argylshire and or The Isle of Jura) in the mid to late 1700's. There has been established there were several Blue families in that area but as of yet I have not been able find which of those families our Blue line is directly connected to. Our Blue Family begins with Archibald Blue. The family moved from Carolina into Crawford County, Georgia by 1825, into Dooly County, Georgia by 1850 and into Taylor County, Florida before 1860. 1. ARCHIBALD1 BLUE1,2,3,4,5,6,7 was born Abt. 1794 in South Carolina. He married FLORA MCMILLAN in Cumberland County, North Carolina. 2. i. SAMUEL L.2 BLUE, b. 1820, North Carolina; d. 1896, Taylor County, Florida. ii. MARY A. BLUE, b. 1827, South Carolina. iii. WILLIAM A. BLUE, b. 1830, South Carolina. iv. ISABELLA J. BLUE, b. 1835, North Carolina; m. JAMES COLLINS, 1855, Dooly County, Georgia. v. FLORA ANN BLUE, b. 1838, North Carolina. vi. GUSTAVUS BLUE, b. 1839, Georgia. 2. SAMUEL L.2 BLUE (ARCHIBALD1)8,9,10,11,12,13,14,15,16,17,18,19 was born 1820 in North Carolina, and died 1896 in Taylor County, Florida. He married (1) MARGARET SPRADLEY. He married (2) SUSANNA. He married (3) CATHERINE ELIZABETH ADAMS20 Abt. 1866, daughter of MILES ADAMS and ANN MAYO. 1864/1865 USA 2nd. Florida Calvary. Notes say he and his son Colon joined as refuges from the Confederacy. It appears neither had been involved militarily until 1864. Elizabeth, after learning of her first husbands death while on her way to visit him at Cedar Key, stopped to stay at a house that was furnished but void of residents. The house belonged to Samuel L. Blue and after coming home found Elizabeth there. Samuel had been recently widowed and was staying with relatives to help care for his small children. Samuel allowed her to stay and they were married about 1 year after that. Elizabeth, after learning of her husbands death while on her way to visit him at Cedar Key, stopped to stay at a house that was furnished but void of residents. The house belonged to Samuel L. Blue and after coming home found Elizabeth there. Samuel had been recently widowed and was staying with relatives to help care for his small children. Samuel allowed her to stay and they were married about 1 year after that. 3. i. COLON3 BLUE, b. March 06, 1842, Georgia; d. January 21, 1920, Perry, Taylor County, Florida. ii. WILLIAM BLUE, b. 1844, Georgia; m. MARY JEAN GREEN, 1867, Dolly County, Georgia. iii. ALZADY OR ASADA BLUE, b. 1846, Georgia; m. WILLIAM J. MCINTIRE, 1877.
iv. WINNEY A. E. BLUE, b. 1848, Georgia. v. SAMUEL M. BLUE, b. 1849, Georgia. vi. CHARLES T. BLUE, b. 1851, Georgia. 4. vii. DANIEL T.3 BLUE, b. 1854, Georgia. viii. DUNCAN BLUE, b. 1856.
ix. ELIZA J. BLUE, b. 1860, Florida. x. MALINDA (MALENDA)3 BLUE, b. 1868, Florida. 3. COLON3 BLUE (SAMUEL L.2, ARCHIBALD1)21,22,23,24,25,26,27,28,29,30,31,32,33,34 was born March 06, 1842 in Georgia, and died January 21, 1920 in Perry, Taylor County, Florida. He married ELIZABETH ANN GROOM December 21, 1865 in Jefferson County, Florida, daughter of FRANCIS GROOM and CATHERINE ADAMS. 1864/1865 USA 2nd. Florida Calvary. Notes say he and his father Samuel joined as refuges from the Confederacy. It appears neither had been involved militarily until 1864.
i. SAMUEL F.4 BLUE, b. 1867. 5. ii. MARGARET E. BLUE, b. 1868. 6. iii. WILLIAM DUNCAN BLUE, b. 1870, Taylor County, Florida. 7. iv. JAMES J. BLUE, b. Abt. 1872, Taylor County, Florida. v. MARY C. BLUE, b. Abt. 1874; m. FRANKLIN J. KING, 1891. 8. vi. ANNA LUZETTA BLUE, b. 1876, Taylor County, Florida; d. 1962, Jacksonville, Duval County, Florida. 9. vii. BENJAMIN HARRISON BLUE, b. January 05, 1877, Taylor County, Florida; d. 1971. 10. viii. DANIEL WASHINGTON BLUE, b. April 26, 1878, Perry, Taylor County, Florida; d. April 21, 1928, Perry, Taylor County, Florida. ix. THEDORA BLUE, b. Abt. 1880.
x. CENIA BLUE, b. 1888; m. RICHARD GROAN. xi. WILLIAM J. BLUE, b. 1892. 4. DANIEL T.3 BLUE (SAMUEL L.2, ARCHIBALD1) was born 1854 in Georgia. He married FANNIE C. RILEY 1881 in Taylor County, Florida. i. WILLIAM S.4 BLUE, b. 1882.
ii. WALTER G. BLUE, b. 1884. 11. iii. SUSAN JOSEPHINE BLUE, b. 1886, Taylor County, Florida. iv. ROSA E. BLUE, b. 1889. 5. MARGARET E.4 BLUE (COLON3, SAMUEL L.2, ARCHIBALD1) was born 1868. She married WILEY ANDREW POPPELL Abt. 1887 in Taylor County, Florida. 6. WILLIAM DUNCAN4 BLUE (COLON3, SAMUEL L.2, ARCHIBALD1) was born 1870 in Taylor County, Florida. He married SARA MALTILDA WOODS. i. LUTHER G.5 BLUE, b. 1891; d. 1976.
ii. ANNIE J. BLUE, b. 1893.
iii. DANIEL C. BLUE, b. 1896.
iv. FRANK G. BLUE, b. 1898. 7. JAMES J.4 BLUE (COLON3, SAMUEL L.2, ARCHIBALD1) was born Abt. 1872 in Taylor County, Florida. He married BLAINE A. ?. i. ALTON C.5 BLUE, b. 1894.
ii. COLON D. BLUE, b. 1896.
iii. ADINER S. BLUE, b. 1899. 8. ANNA LUZETTA4 BLUE (COLON3, SAMUEL L.2, ARCHIBALD1) was born 1876 in Taylor County, Florida, and died 1962 in Jacksonville, Duval County, Florida. She married JAMES ELBERT MOODY 1894 in Taylor County, Florida. 12. v. MAUDE ETHELLE MOODY. vi. WILLIE JOE MOODY, m. ANN ?. 13. vii. JAMES RUFUS MOODY, b. 1894, Taylor County, Florida; d. 1934. 9. BENJAMIN HARRISON4 BLUE (COLON3, SAMUEL L.2, ARCHIBALD1) was born January 05, 1877 in Taylor County, Florida, and died 1971. He married SUSAN JOSEPHINE BLUE 1905 in Taylor County, Florida, daughter of DANIEL BLUE and FANNIE RILEY. i. FOYE5 BLUE, m. (1) JOHN H. EDWARDS; m. (2) ? MCDONALD. ii. CLEO BLUE, m. (1) C. R. GREEN; m. (2) RUPERT FLEMING, 1928.
iii. ALVA LEE BLUE, m. NOAH BISHOP. iv. BONNIE FAYE BLUE, m. LUTHER WILSON. v. CORA LEE BLUE, m. (1) AL BULL; m. (2) RILEY BROWN, 1935.
viii. HUGH/HUGHES C. BLUE, b. 1918. 15. ix. COLON ANSEL BLUE, b. 1921. 10. DANIEL WASHINGTON4 BLUE (COLON3, SAMUEL L.2, ARCHIBALD1)35,36,37,38,39,40,41,42,43,44,45,46 was born April 26, 1878 in Perry, Taylor County, Florida, and died April 21, 1928 in Perry, Taylor County, Florida. He married (1) LOUISANNA ANNA HENDRY 1897 in Taylor County, Florida, daughter of JAMES HENDRY and LOUISANNA WILLIAMS. He married (2) HELON HENDRY47,48,49,50,51,52,53,54,55,56,57,58,59 January 31, 1901 in Taylor County, Florida, daughter of JAMES HENDRY and LOUISANNA WILLIAMS. April 21, 1928 Died in car accident. There are statements on some sites that say his son-in-law, James Sheffield, Gracie's husband was also killed in that accident. Annie Lou Blue Schmid, daughter of Daniel told me in an interview in May, 2001 that it was not true. James died in the same year, within a month or two but he died of a heart attack. Purchased Wiley W. Whiddon homestead (the original deed was in July 20, 1863) around 1908. Member of the Oakland baptist Church. Farmed and raised cattle and hogs, The home was moved to a state park on the south side of Perry on US 19. After Daniel's death in 1928 Helon stayed on the property until 1940 when she moved into town. i. ALMARY5 BLUE, b. July 12, 1898; d. August 15, 1901. 16. ii. EDDIE E. BLUE, b. January 08, 1900, Taylor County, Florida. 17. iii. ELMER5 BLUE, b. October 22, 1901, Taylor County, Florida; d. 1959, Taylor County, Florida. iv. TRESSIE BLUE, b. August 17, 1903; m. WILLIAM H. WALKER, November 11, 1940. 18. v. LESSIE LOUISIANNA BLUE, b. July 13, 1905, Perry, Taylor County, Florida; d. October 18, 1989, Plant City, Hillsborough County, Florida. 19. vi. GRACIE BLUE, b. November 24, 1906, Taylor County, Florida. vii. DEWITT BLUE, b. April 03, 1909, Taylor County, Florida; d. December 18, 1909, Taylor County, Florida. 20. viii. SAMUEL BLUE, b. October 01, 1910, Taylor County, Florida; d. Abt. 1974, Taylor County, Florida. 21. ix. ANNIE LOU BLUE, b. October 12, 1912, Taylor County, Florida. x. MAGGIE LEE BLUE, b. December 25, 1914; d. 1936; m. ? GILL. 22. xi. EVELYN BLUE, b. July 18, 1917, Taylor County, Florida. xii. EVA BLUE, b. April 14, 1919; d. January 19, 1920. 11. SUSAN JOSEPHINE4 BLUE (DANIEL T.3, SAMUEL L.2, ARCHIBALD1) was born 1886 in Taylor County, Florida. She married BENJAMIN HARRISON BLUE 1905 in Taylor County, Florida, son of COLON BLUE and ELIZABETH GROOM. 12. MAUDE ETHELLE5 MOODY (ANNA LUZETTA4 BLUE, COLON3, SAMUEL L.2, ARCHIBALD1). She married ? RICHARDS. 13. JAMES RUFUS5 MOODY (ANNA LUZETTA4 BLUE, COLON3, SAMUEL L.2, ARCHIBALD1) was born 1894 in Taylor County, Florida, and died 1934. He married JANIE MAE WILLIAMS 1925 in Shady Grove, Taylor County, Florida, daughter of ULYSSES WILLIAMS and MOULTON WILCOX. 23. i. JAMES RUFUS6 MOODY, b. 1926, Shady Grove, Taylor County, Florida. ii. ANNIE JANE MOODY, b. 1929.
iii. JOEY MOODY, b. 1930. 14. WOODROW5 BLUE (BENJAMIN HARRISON4, COLON3, SAMUEL L.2, ARCHIBALD1). He married SYBIL KIRKLAND 1937. 15. COLON ANSEL5 BLUE (BENJAMIN HARRISON4, COLON3, SAMUEL L.2, ARCHIBALD1) was born 1921. He married (1) JEANETTE SADLER. He married (2) LETAHA MAE SMITH 1969. 24. i. CLAUDETTE6 BLUE, b. 1952.
ii. SHARLYNE BLUE, b. 1955.
iii. TERRILL BLUE, b. 1957. 16. EDDIE E.5 BLUE (DANIEL WASHINGTON4, COLON3, SAMUEL L.2, ARCHIBALD1) was born January 08, 1900 in Taylor County, Florida. He married INEZ LYONS November 19, 1925.
i. DON6 BLUE, b. May 02, 1931. 17. ELMER5 BLUE (DANIEL WASHINGTON4, COLON3, SAMUEL L.2, ARCHIBALD1) was born October 22, 1901 in Taylor County, Florida, and died 1959 in Taylor County, Florida. He married GRACE LEE. i. ELMER D. JR.6 BLUE, b. February 17, 1926.
ii. ANITA LUCILLE BLUE, b. August 13, 1928. 18. LESSIE LOUISIANNA5 BLUE (DANIEL WASHINGTON4, COLON3, SAMUEL L.2, ARCHIBALD1)60,61,62,63,64,65,66,67,68,69 was born July 13, 1905 in Perry, Taylor County, Florida, and died October 18, 1989 in Plant City, Hillsborough County, Florida. 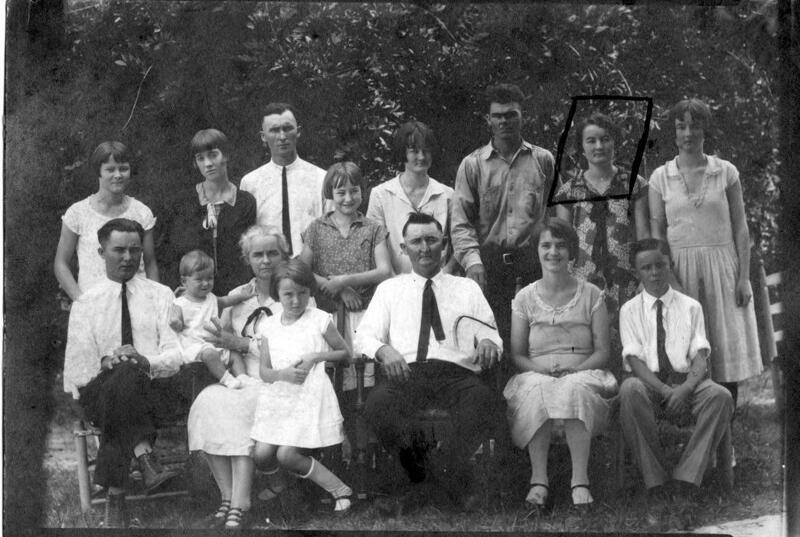 She married HENRY MITCHELL HAGIN SR.70,71,72,73,74,75,76,77,78,79 September 09, 1929 in Perry, Taylor County, Florida, son of JOHN HAGIN and NANCY HENDRIX. 25. i. HELEN GWENDOLYN6 HAGIN, b. January 18, 1931, Hillsborough County, Florida. 26. ii. HENRY MITCHELL HAGIN JR., b. December 15, 1932, Hillsborough County, Florida. 27. iii. SARAH EMILY HAGIN, b. January 12, 1937, Hillsborough County, Florida. iv. CAROL JEAN HAGIN, b. February 06, 1939, Hillsborough County, Florida; m. LOUIS ANDERSON, November 14, 1969, Hillsborough County, Florida. 28. v. DANIEL DOUGLAS HAGIN, b. November 18, 1944, Valrico, Hillsborough County, Florida. 19. GRACIE5 BLUE (DANIEL WASHINGTON4, COLON3, SAMUEL L.2, ARCHIBALD1) was born November 24, 1906 in Taylor County, Florida. She married (1) JAMES SHEFFIELD November 15, 1925 in Taylor County, Florida. She married (2) RICHARD HENDERSON November 15, 1934.
ii. JIMMY SHEFFIELD, b. December 24, 1952. 29. iii. MYRNA6 HENDERSON, b. March 21, 1935.
iv. JERRY HENDERSON, b. February 10, 1937.
v. MARY HENDERSON, b. July 28, 1939; m. GENE LONG. vi. JUNE HENDERSON, b. July 21, 1942; m. BILLY GAY. vii. CONNIE HENDERSON, b. September 12, 1944.
viii. SUE HENDERSON, b. July 21, 1945.
ix. DANNA HENDERSON, b. May 08, 1947. 20. SAMUEL5 BLUE (DANIEL WASHINGTON4, COLON3, SAMUEL L.2, ARCHIBALD1) was born October 01, 1910 in Taylor County, Florida, and died Abt. 1974 in Taylor County, Florida. He married GERTRUDE SHAW in Taylor County, Florida. i. KENNETH6 BLUE, b. January 17, 1939. 30. ii. KARLENE BLUE, b. September 06, 1941.
iii. NEWANNA BLUE, b. December 24, 1949.
iv. KEITH BLUE, b. March 17, 1956. 21. ANNIE LOU5 BLUE (DANIEL WASHINGTON4, COLON3, SAMUEL L.2, ARCHIBALD1) was born October 12, 1912 in Taylor County, Florida. She married HERBERT G. SCHMID April 09, 1933 in Taylor County, Florida. 31. i. HERBERT CHARLES6 SCHMID, b. August 29, 1934, Plant City, Florida; d. February 26, 1994, Taylor County, Florida. ii. CHERRIL SCHMID, b. November 18, 1939.
iii. KAY SCHMID, b. May 22, 1947; m. ? ROYALS. iv. KIT SCHMID, b. July 20, 1949; m. ? BETHEA. 22. EVELYN5 BLUE (DANIEL WASHINGTON4, COLON3, SAMUEL L.2, ARCHIBALD1) was born July 18, 1917 in Taylor County, Florida. She married PETE MCCLELLAN November 23, 1940.
i. FRANK6 MCCLELLAN, b. December 24, 1941.
ii. JOAN MCCLELLAN, b. February 20, 1943.
iii. PAUL MCCLELLAN, b. July 21, 1947. 23. JAMES RUFUS6 MOODY (JAMES RUFUS5, ANNA LUZETTA4 BLUE, COLON3, SAMUEL L.2, ARCHIBALD1) was born 1926 in Shady Grove, Taylor County, Florida. He married SARAH FRANCES TOLAR 1950 in Jessup, Wayne County, Georgia, daughter of RALPH TOLAR and EDNA GARRISS. 32. i. JAMES LEWIS7 MOODY, b. 1951. 33. ii. CYNTHIA ANN MOODY, b. 1954, Tallahassee, Leon County, Florida. iii. SUSAN ELAINE MOODY, b. 1954; m. (1) HIRAM MARLIN ROGERS; m. (2) JOHN LEROY TOWLES. iv. MARY KATHERINE MOODY, b. 1960. 24. CLAUDETTE6 BLUE (COLON ANSEL5, BENJAMIN HARRISON4, COLON3, SAMUEL L.2, ARCHIBALD1) was born 1952. She married JAME NEWTON CRUSE, son of WILLIAM CRUSE and EUDORA DEAL. i. JAMIE7 CRUSE, b. 1972.
ii. BRIAN ASHLEY CRUSE, b. 1975.
iii. COREY CRUSE, b. 1979. 25. HELEN GWENDOLYN6 HAGIN (LESSIE LOUISIANNA5 BLUE, DANIEL WASHINGTON4, COLON3, SAMUEL L.2, ARCHIBALD1) was born January 18, 1931 in Hillsborough County, Florida. She married (1) GEORGE BRANDEWIE. She married (2) LARRY BEAZLEY. i. KIMBERLY ERIN7 BRANDEWIE, b. May 31, 1962, Tampa, Hillsborough County, Florida; m. JERRY HATLEY. 26. HENRY MITCHELL HAGIN6 JR. (LESSIE LOUISIANNA5 BLUE, DANIEL WASHINGTON4, COLON3, SAMUEL L.2, ARCHIBALD1) was born December 15, 1932 in Hillsborough County, Florida. He married CELESTA LASTINGER in Hillsborough County, Florida. 34. i. DWIGHT7 HAGIN, b. November 13, 1956, Hillsborough County, Florida. 35. ii. DIANE HAGIN, b. May 10, 1959, Hillsborough County, Florida. 36. iii. DONNA HAGIN, b. December 12, 1960, Hillsborough County, Florida. 27. SARAH EMILY6 HAGIN (LESSIE LOUISIANNA5 BLUE, DANIEL WASHINGTON4, COLON3, SAMUEL L.2, ARCHIBALD1) was born January 12, 1937 in Hillsborough County, Florida. She married NEIL COLEMAN. 28. DANIEL DOUGLAS6 HAGIN (LESSIE LOUISIANNA5 BLUE, DANIEL WASHINGTON4, COLON3, SAMUEL L.2, ARCHIBALD1) was born November 18, 1944 in Valrico, Hillsborough County, Florida. He married CAROLYN ALLEN80 September 19, 1964 in Tampa, Hillsborough County, Florida, daughter of RANDALL ALLEN and WILLIEMAE LOWE. i. MICHAEL DOUGLAS7 HAGIN, b. September 22, 1965, Tampa, Hillsborough County, Florida. 29. MYRNA6 HENDERSON (GRACIE5 BLUE, DANIEL WASHINGTON4, COLON3, SAMUEL L.2, ARCHIBALD1) was born March 21, 1935. She married OSWALL WINCHESTER June 22, 1951. 30. KARLENE6 BLUE (SAMUEL5, DANIEL WASHINGTON4, COLON3, SAMUEL L.2, ARCHIBALD1) was born September 06, 1941. She married JIMMY OSTEEN. 31. HERBERT CHARLES6 SCHMID (ANNIE LOU5 BLUE, DANIEL WASHINGTON4, COLON3, SAMUEL L.2, ARCHIBALD1) was born August 29, 1934 in Plant City, Florida, and died February 26, 1994 in Taylor County, Florida. He married SHIRLEY MAY ROBERTS October 23, 1959. 37. i. SHEILA7 SCHMID, b. September 17, 1961, Perry, Taylor County, Florida. 38. ii. SYLVIA ANNETTE SCHMID, b. November 07, 1963, Perry, Taylor County, Florida. 39. iii. MICHAEL CHARLES SCHMID, b. August 21, 1970, Perry, Taylor County, Florida. 32. JAMES LEWIS7 MOODY (JAMES RUFUS6, JAMES RUFUS5, ANNA LUZETTA4 BLUE, COLON3, SAMUEL L.2, ARCHIBALD1) was born 1951. He married GAYLE MEADOWS. i. WILLIAM GARRISS8 MOODY, b. 1976. 33. CYNTHIA ANN7 MOODY (JAMES RUFUS6, JAMES RUFUS5, ANNA LUZETTA4 BLUE, COLON3, SAMUEL L.2, ARCHIBALD1) was born 1954 in Tallahassee, Leon County, Florida. She married DAVID LEWIS GOODMAN 1985 in Taylor County, Florida, son of RAYMOND GOODMAN and LEATHA SMITH. i. JOSHUA LEWIS8 GOODMAN, b. 1986. 34. DWIGHT7 HAGIN (HENRY MITCHELL HAGIN6 JR., LESSIE LOUISIANNA5 BLUE, DANIEL WASHINGTON4, COLON3, SAMUEL L.2, ARCHIBALD1) was born November 13, 1956 in Hillsborough County, Florida. He married (1) TERESA ALDERMAN in Hillsborough County, Florida. He married (2) HELEN KILLINGSWORTH in Hillsborough County, Florida. i. ROBERT DWIGHT8 HAGIN, b. June 13, 1984.
ii. BRODY MITCHELL8 HAGIN, b. July 31, 1991.
iii. PARKER REED HAGIN, b. April 08, 1993. 35. DIANE7 HAGIN (HENRY MITCHELL HAGIN6 JR., LESSIE LOUISIANNA5 BLUE, DANIEL WASHINGTON4, COLON3, SAMUEL L.2, ARCHIBALD1) was born May 10, 1959 in Hillsborough County, Florida. She married ERIC RUBIO December 17, 1982 in Hillsborough County, Florida. i. EMILY DIANE8 RUBIO, b. February 11, 1985.
ii. PAUL ERIC RUBIO, b. February 02, 1989. 36. DONNA7 HAGIN (HENRY MITCHELL HAGIN6 JR., LESSIE LOUISIANNA5 BLUE, DANIEL WASHINGTON4, COLON3, SAMUEL L.2, ARCHIBALD1) was born December 12, 1960 in Hillsborough County, Florida. She married (1) NELSON LOPRESTO in Hillsborough County, Florida. She married (2) LARRY ALDERMAN. i. ALEX DONNY8 LOPRESTO, b. December 14, 1987.
ii. MARCUS ELLIOT LOPRESTO, b. February 15, 1990. 37. SHEILA7 SCHMID (HERBERT CHARLES6, ANNIE LOU5 BLUE, DANIEL WASHINGTON4, COLON3, SAMUEL L.2, ARCHIBALD1) was born September 17, 1961 in Perry, Taylor County, Florida. She married THOMAS VAUGHN THOMLEY March 06, 1982.
i. PHILLIP CHARLES8 THOMLEY, b. July 02, 1987, Gainesville, Florida. ii. JASON LUKE THOMLEY, b. June 14, 1989, Tallahassee, Florida. iii. LAUREN ESTHER THOMLEY, b. February 19, 1996, Tallahassee, Florid. 38. SYLVIA ANNETTE7 SCHMID (HERBERT CHARLES6, ANNIE LOU5 BLUE, DANIEL WASHINGTON4, COLON3, SAMUEL L.2, ARCHIBALD1) was born November 07, 1963 in Perry, Taylor County, Florida. She married MICHAEL NORMAN MATTHEWS October 09, 1987.
i. BENJAMIN MICHAEL8 MATTHEWS, b. July 23, 1990.
ii. JACOB ANDREW MATTHEWS, b. January 05, 1993.
iii. IAN SETH MATTHEWS, b. September 09, 1996. 39. MICHAEL CHARLES7 SCHMID (HERBERT CHARLES6, ANNIE LOU5 BLUE, DANIEL WASHINGTON4, COLON3, SAMUEL L.2, ARCHIBALD1) was born August 21, 1970 in Perry, Taylor County, Florida. He married BRENDA ANN GARRISON February 19, 1994.
i. ETHAN MICHAEL8 SCHMID, b. May 20, 1996.
ii. AUSTIN TYLER SCHMID, b. May 18, 1998. 1. 1840 Dooly County Georgia Census. 2. 1850 Dooly County Georgia Census. 3. WH Blue's Scottish Families in America. 8. 1850 Dooly County Georgia Census. 9. 1840 Dooly County Georgia Census. 10. 1850 Taylor County Florida Census. 11. 1860 Taylor County Florida Census. 12. 1870 Taylor County Florida Census. 14. Bureau of Land Management, Eastern States, General Land Office. 17. Roster of Union Soldiers. 18. Pat Imbimbo, "Treachery in Florida," North & South Vol 3 # 4 April 2000. 19. "The Old Man" Colon Blue by W. T Cash. 20. 1860 Mitchell County Georgia census. 21. 1850 Dooly County Georgia Census. 22. 1850 Taylor County Florida Census. 23. 1860 Taylor County Florida Census. 24. 1870 Taylor County Florida Census. 26. Assorted Family Notes and Recollections. 27. Bureau of Land Management, Eastern States, General Land Office. 28. Family notes and interviews. 29. Hendry of Clan McNaughton. 31. Personal Visits to Pisgah Cemetery, Taylor County, Florida. 32. Roster of Union Soldiers. 33. "The Old Man" Colon Blue by W. T Cash. 34. Pat Imbimbo, "Treachery in Florida," North & South Vol 3 # 4 April 2000. 35. 1880 Taylor County Florida Census. 36. 1920 Taylor County Florida Census. 37. 1890 Taylor County Florida Census. 39. Assorted Family Notes and Recollections. 40. Bureau of Land Management, Eastern States, General Land Office. 41. Family notes and interviews. 43. Hendry of Clan McNaughton. 45. Personal Visit to State Museum Perry, Taylor County, Florida. 46. WH Blue's Scottish Families in America. 48. Assorted Family Notes and Recollections. 49. Family notes and interviews. 51. 1880 Taylor County Florida Census. 52. 1890 Taylor County Florida Census. 53. 1900 Taylor County Florida Census. 54. 1920 Taylor County Florida Census. 56. Hendry of Clan McNaughton. 57. Personal Visits to Hendry Family Cemetery Shady Gove Florida. 58. Personal Visits to Lake Bird Methosist Cemetery, Lake Bird, Florida. 59. Personal Visits to Pisgah Cemetery, Taylor County, Florida. 61. Assorted Family Notes and Recollections. 62. Family notes and interviews. 63. Hendry of Clan McNaughton. 64. Interview with Fanie Mae Thompson Mclean. 66. Original Marriage License September 9. 1929. 70. 1920 Hilsborough County Florida Census. 71. Assorted Family Notes and Recollections. 72. Family notes and interviews. 73. Hendry of Clan McNaughton. 74. Interview with Fanie Mae Thompson Mclean. 75. Marriage Records Hillsborough County Florida. 77. Original Marriage License September 9. 1929. 79. Personal Visits to Hendry Family Cemetery Shady Gove Florida.